So after my recent run-in with moths, I was feeling really vulnerable and unpleasant. Even if I'd been able to mend the FOs, and even though I didn't lose that much yarn, the feeling that my stash is not 'safe' has been getting to me. It'd led me to thinking about my stash in new ways, and I'm resolving to knit down my stash to a more manageable size over the next year. Completely contrary to that idea, though, after the moth attack I needed more yarn. New yarn. Yarn that was guaranteed to not be infected. 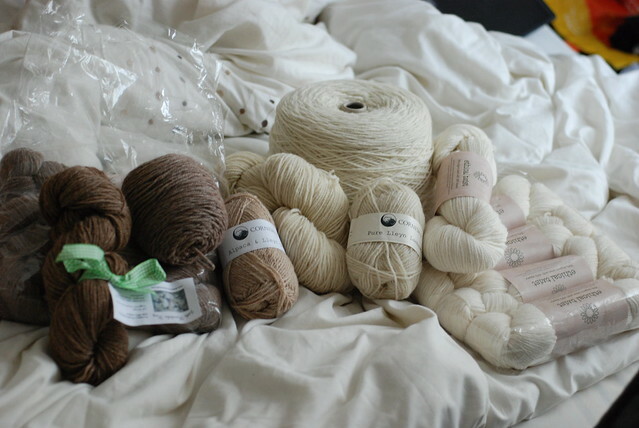 So, I went a little crazy, and I got a lot of yarn. These yarns are all part of Layter (though I will also have plenty of leftovers to make at least one other sweater -- that cone of Whitefaced Woodland is a full kilo!). 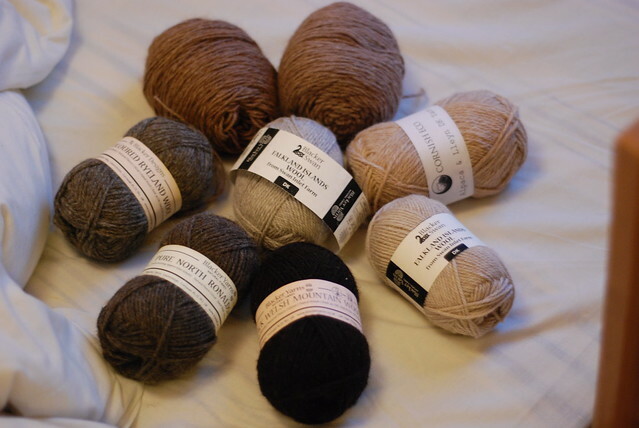 I took my yarns from a variety of sources - all either small operations or organic, all natural colors, and all British (providing you count the Falklands as British). 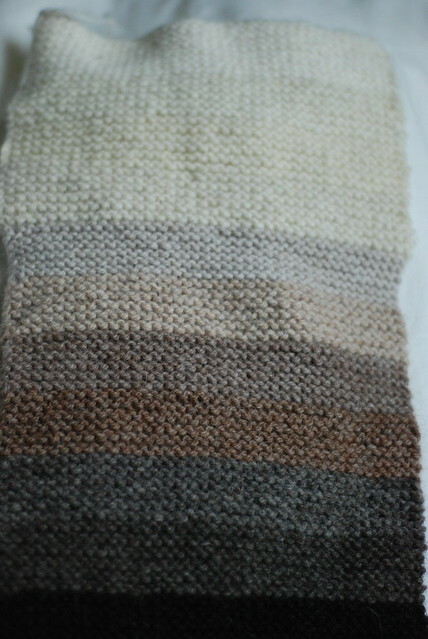 There's a mix of 100% wool and wool/alpaca blends. Some of the places the yarns come from are Blacker Yarns, Cornish Wools, and Rosewood Farms -- you can see the full list on my project page. Felix describes knitting Layter as a "cheese-tasting of fibres", and I definitely got a sense of that while swatching. I wanted to swatch every one of my Layter yarns to make sure that they played together well - to be aware of gauge differences since I got my yarns from different sources, and to make sure I was happy with the progression of stripes. The garter stitch, of course, knit up in no time at all, and there was a compelling feeling of "one more row" - or rather, "one more stripe". I hope this speed and enthusiasm will carry over to the actual jumper! Getting to know each of the wools is exciting - some, like coloured Ryeland and North Ronaldsay, are like old friends - I've spun them before, and it's a pleasure to knit with them and recognise the hand of the fibre. Some are brand new - like Whitefaced Woodland and Lleyn. It's a real pleasure to see the natural colours next to each other. My gradient isn't perfect, but I like it. Seeing each of the white/cream yarns knit up together was a revelation - in the ball they look almost identical, but when you look at them knit up one after the other, you can see the subtle differences in tone.